with our BIGGEST SHOW EVER! Early on Samim joined forces with Michal Ho, producing a wide range of music under the "Samim & Michal" brand. After their first EP "Dini Muater" appeared on the Zurich based label "Stattmusik" the duo was poised for success. They went on to release three successful EPs (F / Angel / Ripop) on Jay Haze's Tuningspork and Textone Imprint, developing their trademark sound even further. In 2004, due to a serious cancer illness Samim was forced to take a break just to reappear shortly after, more determined than ever and ready to take the next step in his career. In late 2005 he relocated from Zurich to Berlin, opening up a whole new range of musical opportunities. Samim immediately tapped into the Berlin scene, initiating his most productive time so far. He released a series of very successful 12" on labels like Circus Company, Moon Harbour, Tuning Spork, Wasnotwas and Freizeitglauben and due to popular demand got remix assignments from labels like Get Physical, Highgrade and Crosstown rebels. At the same time he focused more on the Album format, producing two full length releases under the brands Bearback and Fuckpony (Album: Children of Love / label: Get Physical). Samim recently released his first solo full length album "Flow" on Get Physical, which features the massive worldwide hit "Heater". His live operations have brought him to numerous clubs and venues all over the world, making him one of the most comprehensive entertainers currently available. Alex Smoke is unique talent to emerge from the Glasgow music scene. This young producer is pushing the boundaries of electronic music with his innovative fusion of deep European minimalism with emotional strings and intellegent electro rhythms. Alex has a classical music background which reveals itself in the quality of his arrangements. In the past two years the music world has witnessed his rapid ascent through the ranks of the techno elite. Since the 2005 release of his brilliant debut LP on Soma, 'Incommunicado' he has been booked to play the clubs and festivals of the UK, Europe and beyond. His coveted releases on Berlin label Vakant have cemented his club credentials and found their way into boxes and laptops of innovative DJs everywhere. Not content with a slew of killer twelves, Alex Smoke remixes have constantly been in demand, recently renovating Mylo, Alex Under and Vector Lovers. 2006 has shaped up to be another monumental one for Alex Smoke with the release of his second LP, 'Paradolia' and subsequent UK, European, and US live tours. Lee has always found sanctuary in the corners of his mind, for in the corners you will find your true nature and true creative being. His mission is to free people from the confines of the music they are accustomed to listening to and elevate electronic music to the next level. He found himself fixated on music from an early age, constantly learning more about music as he taught himself to play several instruments over time. When he found the dance music scene, he immediately moved away from rock oriented instruments and gravitated toward electronic music. He was completely fascinated by the anonymity of artists, the raw power of the music and how it made the crowd move with every churning rhythm until it seemed everyone was ready to lose their minds all at once. After traveling to Detroit and Chicago he realized that he had something to contribute to this music and began collecting records and DJing in 2000. Two years later he had amassed enough knowledge and equipment to commit to producing full force. He soon relocated from Grand Rapids to Detroit where he broadened his musical scope and continued sharpening his skills. His music has become a heavily German influenced form of minimal with an unorthodox approach to textures and rhythms, using lo fidelity to create elements of disarray surrounded by crunching beats, tweaky synthlines, held together by bubble gum sticky bass lines. With a recent 3 month tour of Europe behind him, a track on the new Audion Fabric mix, and upcoming releases on Spectral Sound, Underl_ne, and Milnor Modern, Lee Curtiss is an artist clearly on his way up and showing no signs of slowing down. oh oh. company xmas party same night. this could get interesting. You'll more than likely be able to make Alex's set. I'll hit you up with set times once I know them. 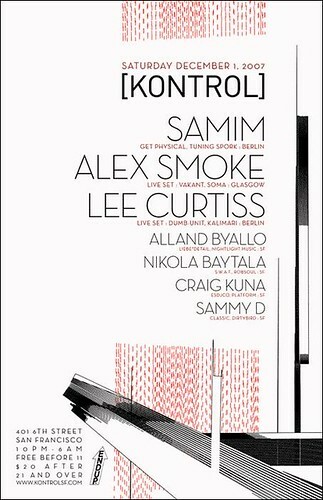 We didn't put it on the poster cuz we weren't sure at the time, but Samim is playing LIVE too! See y'all out. Sure to be an EPIC night.